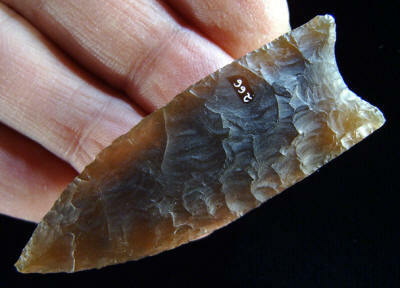 This Goshen point is described by Frison and Bradley as a point that, "conforms in shape to the general description of Goshen points." The hafting area edges on this point (proximal edges) are straight but expand slightly towards the point (distal portion). Pressure flaking on both sides was selective with a wide range of flake scar widths. Pressure flakes on the base are not large enough to be considered basal thinning. The material is not identified. 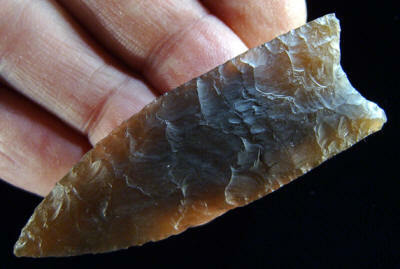 This point measures 2 1/2 inches (6.3 cm) long. Thirty-one projectile points were found on the Mill Iron site. Eleven were found in the camp area, twelve in the bone bed meat processing area and seven points were found on the surface. These points exhibit a fairly wide range of style and flaking technique. Some of the bases are almost straight, while others vary from slightly to fairly deeply concave, like this example. Also, some of the basal edges are concave but they are straight at the base of the concavity, similar to some Folsom points. The sides are straight to slightly convex and one example appears to be slightly fish-tailed. Picture of opposite side of point illustrated above, showing random flaking.